MikeCat’s review of the year…. Hiya! So it’s been quite a while since our last entry for the Cat Diaries hasn’t it? How busy we were! We started 2018 with our usual stomping gigs at Granvilles and new venue The Filling Factory in Buckshaw Village, Chorley, a quirky and groovy place. We also took the time to rehearse new songs for the set and first dances for weddings which was really fun. We really do work hard at finding the right songs to play and do our own thing to them. Amazing how many songs we’ve gone through and played live. Some stay for a while, go on holiday and return like those wandering cats and just settle back as if they’ve never been away sometimes! March was extremely busy with Laura’s 40th in the Horwich snow, Granvilles, Jack Rabbit’s in Knutsford and Platform 5 in Cheadle Hulme. It’s not every day you see an old fellah jammin’ on his walking stick next to Ste and Joe but you do in Cheadle Hulme! We also returned to Peover for a wedding and were completely confused thinking we’d played somewhere exactly like The Oak Tree before – we had many moons ago when it was a golf course! April saw us all over the north west. First was the Adventure Scouts going bonkers yet again for another year in The Lakes – hard to come off stage there as they always want more and sing every song back to us. I managed to play fuel roulette on fumes, sweating to find a garage on the way home. Thank you The Canal Garage on A65! Parties in Preston and another in a tepee in Appleton which was quite, quite mad. The George & Dragon in Barrowford and Jeremy’s in Brighouse were rockin’ good nights as ever. By now, the new songs and medleys were well bedded into the set and it’s really good seeing them in the setlist, still trying different lines and parts for giggles. We’ve so many now, every night is different. A run of parties, weddings and charity balls had us sweating all for the good throughout the summer. Emily’s wedding at the Upper House in Barlaston was a corker; Party on the Lake at Pickmere was another outstanding success if we don’t mind saying so and the scorching heat didn’t stop us filling the dance floor at Bowden Rugby Club for St Vincent’s PTA Ball and it wasn’t us tripping the generator! Emily’s wedding on a scorching evening at the gorgeous Old Grammar School in Middleton saw us pull a few old songs out the bag for her requests which was fun. That started a triple header weekend ending with our annual outing to Cawood Holiday Park (why can’t we ever navigate that roundabout??? ), with our debut at The Flying Horse Hotel in Rochdale sandwiched between them. The Flying Horse is becoming one of our favourite public gigs the more we’ve played there so keep an eye out for our next appearance there. The Mercure Georgian House in Blackrod for Paul and Deborah’s wedding was lovely – I hadn’t seen Paul since leaving school and it was an absolute honour and pleasure to play for him. The very talented Kyle Hassall, photographer extraordinaire, joined us the Worsley Marriott Hotel for Clare and Chris’s wedding – you can see the photos here. Another bouncing wedding up in the Lakes rounded off the summer. We had a little time in September so rehearsed for more new songs, medleys, frivolity and jolly japes. We visited Buxton, Blackpool, Congleton and the Marriott Renaissance Manchester for the Mancunian Way Ball of which Joe is a trustee. Home town gig for Ste in Westhoughton – he and his brother entertained us as Elvis impersonators for his mum and dad’s Golden Wedding anniversary. Uh huh. All this despite most of us being hit with cat flu but we troopered on through, especially Kirsty when she had ‘razor blades for a throat’! Our first ever Christmas with The Cats organised by Steve and Anne was an awesome night – it was so good we’re doing it again next year! We also celebrated Christmas with a mammoth game of Pictionary (rock ‘n’ roll) in Liverpool before Sian and Richard’s wedding and wound up the year at the magnificent Peckferton Castle where we’d had our very first promo shots. It’s been 8 years since we started the madness in a cold rehearsal room banging out tunes for hours on end until they were just right. We have no intention of letting up now. We’re back in rehearsing more new stuff in March – what do you want to hear? Let us know! 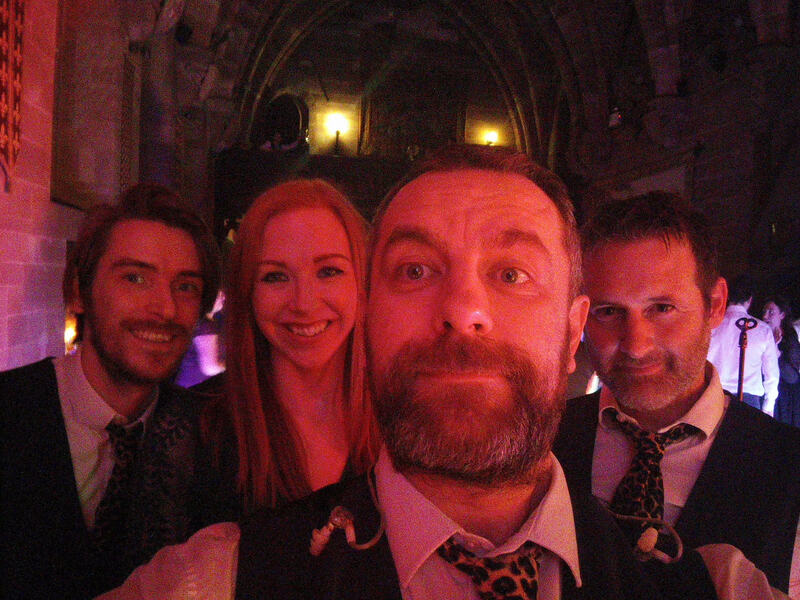 Ste’s trousers are holding up well and not split, Joe still plays awesome tunes and hidden gems for our DJ service, Kirsty still sounds phenomenal and kicks our backsides when needed and I still hits things quite a bit. We still mix up our days and nights. We’ve sampled many a buffet, hogroast and 3 course meal so thank you to all who feed us. Even service stations at 3am. Top tip: there’s always some wedding cake at 12.30am. The M6 through Staffordshire is still a pain and I’m sure the Highways Agency check our gig diary to fetch in diversions at 2am. If you’ve seen us you know we love what we do and we love seeing how much you guys and gals love it too! Stay furry and purry and see you at the next gig! Happy New Year from the Midnight Cats! Well it’s been a year since our last chin wag so it’s time to stroke our whiskers, curl up in front of the (almost) yuletide fire and muse over what has been another fantastic and eventful 2017! So what did we get up to last year? – I hear you holler in anticipation from in front of your screens. 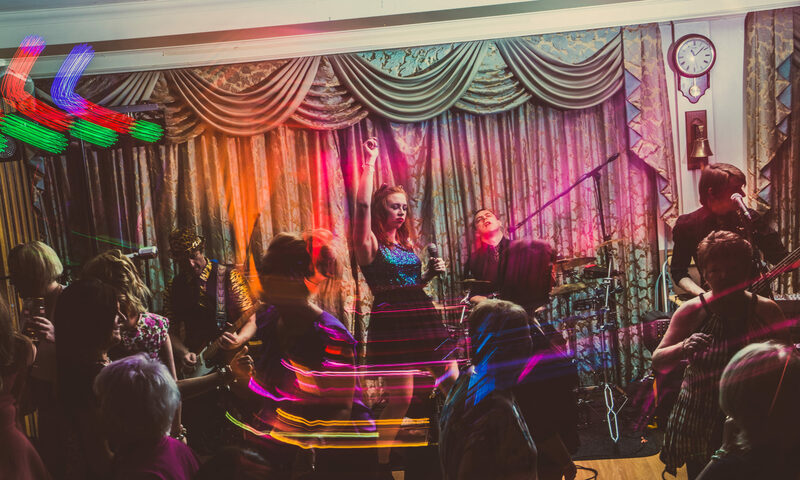 Well from individual points of view, Kirsty Cat has embraced motherhood with open arms and after her maternity break managed to successfully juggle nappies and microphones to spearhead our band with her usual enthusiasm and talent. Joe Cat has discovered that speed cameras around the Staffordshire area are cunningly placed and actually work. Ste Cat is still attempting to do the splits whilst only being understood half of the time due to his accent. Mike Cat is still perturbed by the lack of success at Everton Football Club and takes this frustration out weekly on his tubs whilst still refusing to explain the significance of those two purple roses at the front of his kit. Music wise we have had the pleasure to play at some wonderful new wedding venues. Colshaw Hall in Knutsford is a fantastic place which we have graced a couple of times this year. Heath House in Staffordshire was like Wayne Manor with the friendliest hosts you could wish for. We also got to pastures new such as the Fence Gate, Lancashire, the absolutely stunning Inn on The Lake in Glenridding, Cumbria, the 3 Horeshoes in Leek as well as performing at the many venues that we have done on plenty of occasions that would take an age to list. 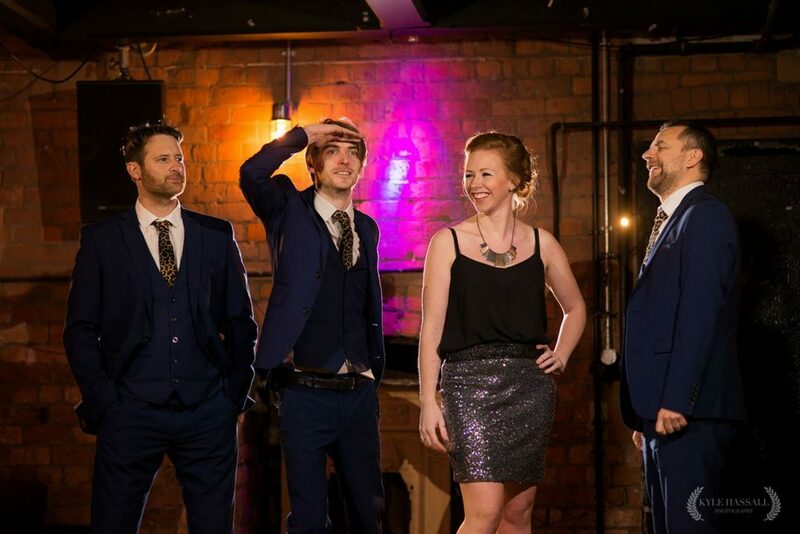 We had the privilege of playing in Manchester at the Mancunian Way Charity annual ball for the 2nd time in December. The previous year was at The Midland Hotel and was such a success that this year it expanded and was held at the Hilton Hotel. We have already been asked back for later this year so we must be doing something right. Re-bookings are a big part of our calendar too, it’s nice to know people trust in you to give them the party night they crave for. We are working on trying to get more public gigs into the calendar as well. Unfortunately Hogan’s of Hale sadly changed hands so is no longer a live venue on our circuit, but we should be popping up as always at Granvilles in Stone, Jeremy’s in Brighouse, Jack Rabbits in Knutsford, Platform 5 in Cheadle Hulme and hopefully a couple of others so keep your eyes peeled on our Facebook page for more info. We have already got a definite date for The Filling Factory No.1 in Chorley for Saturday 3rd Feb 2018. This is shaping up to be a firecracker of a gig so hope to see you there! As always we are constantly adding to our setlist so had a bagful of new songs to put in this year, we have such an extensive list now it’s hard to choose which to leave out – all thriller, no filler, it’s a nice problem to have. Recently we celebrated our 250th gig as a band too, we are still going strong and have no intention of slowing down. If you guys keep coming for us – we’ll keep delivering the choooons!! January and February is a surge time for bookings, so get in asap if you want to book us! Once again, from the bottom of our Cat hearts, we thank everyone who has supported us this year – venues, brides, grooms, clients, pets, husbands, girlfriends, parents, babies, Red Bull, water, buffets, whisky, Lemsip, etc. We look forward to seeing you all at upcoming gigs. Keep it CAT – it’s where it’s AT! So we said goodbye to a hugely successful 2016 and welcomed in what promises to be a great 2017 for us Cats at one of our regular haunts, Denton Golf Club. 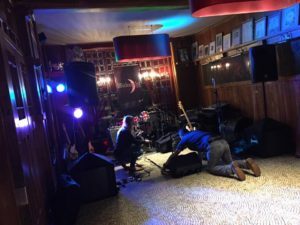 It is always a very welcoming venue for us this one and we have become quite a favourite of theirs over the last few years – so much so that they have already secured our services for next New Year’s Eve as well. Hoorah! January and February are a traditionally busy time regarding enquiries for us and this year is no exception as dates are already being snapped up. If you are thinking about booking us for your wedding, party, or function, it is best advised to do it as early as you can to avoid disappointment. 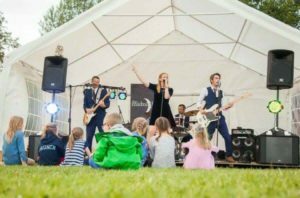 Also, as our reputation continues to grow, we do get quite a lot of re-bookings for annual functions as people/companies/businesses trust us and know that we always deliver a top show, so every year the diary gets topped up that little bit more! We often get asked by many people where they can come and see us. The bulk of our work is mainly private functions but we do pop up in public venues every once in while. If anyone out there would like a list of our public dates just drop us an email and we will happily send you a list, might be worth keeping an eye on our Facebook and Twitter pages too as sometimes we step into last minute cancellations for other bands. Our regular public gigs tend to be at Hogan’s of Hale and Granvilles Brasserie in Stone, we play there a several times a year. We are also currently working on getting on at a venue in Knutsford too. So this year has already seen us tweak our set-list with some new tunes, which are already turning dance floors into a right good bop-fest! As always we put our very unique Cat twist on them to keep both ourselves and our audiences on their toes. We’ve had to retire/rest a couple of trusty old servants that served us well last year but there’s nothing like putting some fresh floor-fillers in, especially with all the re-bookings we do. Last weekend saw us do our first wedding of the year at the Belle Epoque in Knutsford. Lovely venue to play this with the most helpful staff you could wish for. The night was an absolute rip-snorter, the floor was buzzing from the first dance right until the last notes of our encore. Punita and Phil, our bride and groom, were totally made up with us and we got some heart warming comments from their family and friends. They were definitely one of those audiences you wish you could just scoop up and take everywhere with you! 2017 is already shaping up to be a belter – it’s only January, bring it on! Thanks to everybody who follows and books us for your continued support – and remember kids – CAT is where it’s AT ! So here it is. Our first blog! You catch us at a time of baby wipes, nappies and night time feeds. But enough of Ste’s off-stage shenanigans. If you didn’t know (and why not??!?!) Kirsty is currently on maternity leave after giving birth to her first born. Her last weekend of gigs in August included the awesome wedding of Tara and Mark at West Tower, Aughton. We’d played there many moons ago and it’s a gorgeous venue. It was truly one of the epic Midnight Cats’ nights with endless dancing and singing with the guests. The dancefloor was so full we had dancers spilling on to the stage area which just added to the fun. Second up was Hannah’s 40th in the wilds of Staffordshire in her barn. Or a cattle shed. Or a stable! Immaculate birth? Well, we did have a Joseph with us… Anyway, Steve and Joe managed to climb the bales of hay and rock out with the kids mid-set. I say managed but in all honesty, Steve was caught out by a squidgy bale and giggled his way crawling to the top. While Kirsty is away we have the very talented Olivia filling in and she’s slotted in very well indeed. She’s been introduced to the legendary Midnight Cats’ diversions roulette and lashing rain at 2am that Moses would have trouble parting. The Gods of Apt told us to learn Earth, Wind & Fire’s ‘September’ in September which we lurrrve playing at the moment. There’s a prize if you can guess how Ste gets those high notes. YEEHAW! There was also our first western themed birthday party for Hannah outside Stone, Staffordshire!!! Obviously, we excelled at the dressing up as we always do and Joe said I’d aced it with an impressive set of burns and whiskers if I don’t mind saying so myself. As ever, photos galore of our antics on Facebook. Tag yourself and spread the word! We’re back at Hogans of Hale on Saturday 15th October and Granvilles of Stone on Friday 16th December so put them in your diary and see you there! By the way, support your local businesses – Love To Sew of Westhoughton do a very quick service if you rip your trousers.